UNITY Peer Guide Program – UNITY, Inc. The project builds on the successes of the past Office of Juvenile Justice and Delinquency Prevention (OJJDP) National Intertribal Youth Leadership efforts and the Today’s Native Leaders program. The initiative will support and enhance Native youth engagement, coordination, and action related to public safety issues, with a focus on juvenile justice and delinquency prevention in Indian country. UNITY will be recruiting a diverse group of youth leaders and mentors, who will design and facilitate intensive training in critical aspects of juvenile justice and delinquency prevention efforts for cohorts of youth throughout the country. • Young people will receive training to serve as peer leaders who will provide training, mentoring, support, resources, information, and other assistance for their peers in efforts to increase public safety and creatively prevent and address juvenile delinquency. 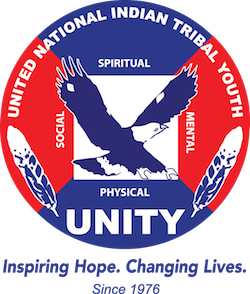 • UNITY, with its trainers, youth guides, and mentors will offer regional youth leadership development trainings that will enable Native youth, and their adult advisors, to develop and carry out projects, programs, education, awareness campaigns, and other efforts within their communities. • The projects will benefit communities while providing valuable real-world leadership experiences that will better prepare the youth to succeed in their leadership roles. Products: The project may be inclusive of webinars. Communities may request personalized trainings to be held in their host communities. A Complete Application Packet includes a completed online Nomination form and a Personal statement form submitted before the deadline. 12 Selected Peer Guides will be Announced on May 1, 2019. ● Agree to participate in all Peer Guide training sessions, teleconferences, webinars; and provide Peer Guide reports. ● Age 18 to 24 when applying. ● Provide proof of tribal enrollment upon request, from a state or federally recognized tribe. Applicants must complete and submit the application form prior to the noted deadline. a mentor, teacher, coach, supervisor, counselor or friend. Please note that only online submissions will be accepted for consideration.